Life logging, journaling... what now? The idea behind this post grew from an insight I had, two months ago. I realised that I was bookmarking a lot of web pages because I liked what they explained and wanted to remember what I read. More precisely, I wanted to remember that I had read that. At that time, this seemed the more natural way to approach this problem. A month later, more or less, I landed in this New York times article: The Data-Driven Life. This was closer to what I needed (and geekier), but after trying to log my activities, I had to give up. There is no point in knowing that yesterday at 16:33 you had a coffee. This is not what I needed. All pieces felt into place last week, when I read this post (How to keep track of what you've learnt) at Oscar del Ben's blog. I don't need to track my daily activities, I have to track my daily knowledge flow. My understanding of Oscar's approach was a little biased at first. How could I track what did I learn yesterday from my Icelandic self-course? This would mean something like rewriting the full lesson. Not like it would serve nothing, but was not what I needed. Then I realised. I just gave it another name, and then it was natural. Known before as journaling, recently hyped as life logging. 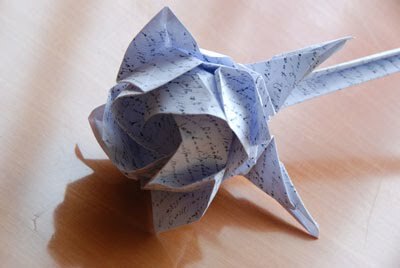 Maybe a rose's scent would not be better, but life bookmarking is the name that makes this interesting. 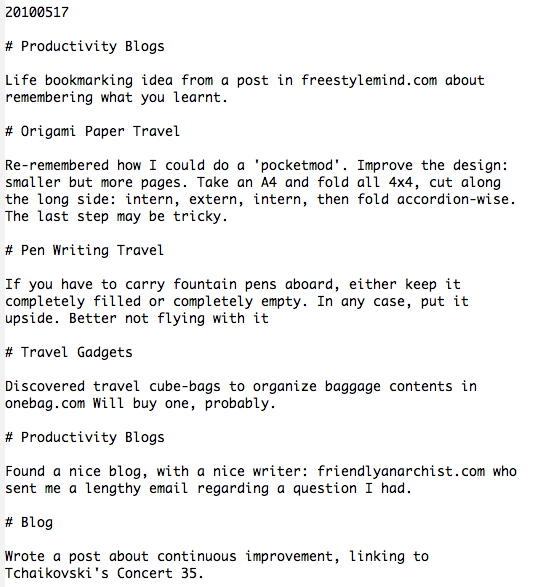 Life bookmarking implies writing (electronically) what you have learned today. It can be Lesson 10 in Teach Yourself Icelandic, a game you discovered while reading Slashdot (foldit) or a good blog with a nice owner (friendlyanarchist.com). A sample from my life bookmark file for 20100517 follows as an image. I usually do a clean sweep from everything I learnt today each night on the Notes app in my iPod Touch. It takes me around 15 minutes while watching the TV. The naming scheme is YYYYMMDD, this naming scheme makes alphabetical sorting work as date sorting. Why is it important? As I read yesterday's endeavours today, I may remember something I have to add, and then date sorting is screwed. I use also categories for each entry. An entry is just something that is below a category, and categories are in lines starting with a #. This makes it easier to write a Linux shell script that could select relevant files based on category lines (using grep). The goal of all this is having an electronic database of your life. You can then easily track when you wrote that post in your blog, or which day you sent that paperwork to your government. 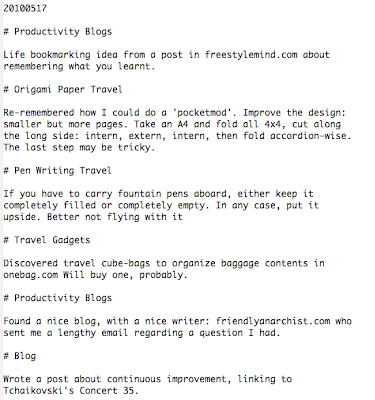 Slowly (well, in 3 days) my life bookmarking looks a lot like journaling. I keep writing all I learn, but also more and more what I have done today, from a top-down approach. Just log the what (sent that silly paperwork) and not the how (went to the post office to). If something interesting happened in the PO, you may add that, maybe under another category. This serves to track what I have done, but more important to track what I learnt that day and all in the tip of my fingertips.